During the legendary Battle of Britain Spitfires of 92 Squadron are engaged with Messerschmitt Me109s of JG-2 in a high-altitude dog-fight directly over London in September 1940. Way below, bombers of the Luftwaffe attempt one of their final daylight raids over the capital. 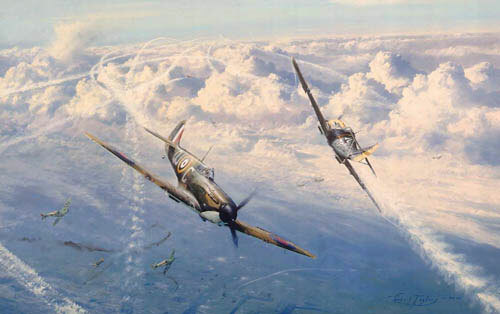 Each print is signed by Six famous Battle of Britain Aces.